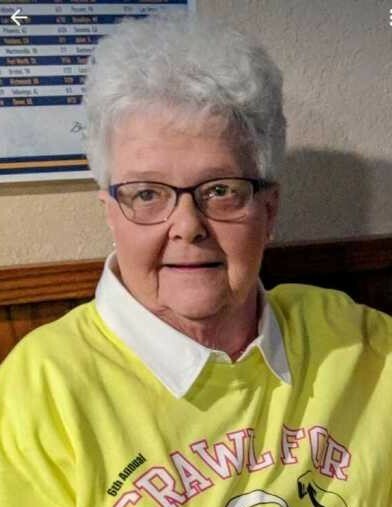 Linda Lee Church, 72, of Breckenridge, MN, passed away at St. Catherine’s Living Center, Wahpeton, on Monday, February 11, 2019, after a battle with cancer. Visitation will be held from 5 p.m. to 7 p.m., Friday, February 15, 2019, with a prayer service at 7 p.m. at Joseph Vertin and Sons Funeral Home, Breckenridge. Visitation will resume from 9:30 a.m. to 10:00 a.m., Saturday, February 16, 2019, at the funeral home followed by the funeral service at 10:30 a.m. at St. Mary’s Catholic Church, Breckenridge. Burial will be held at a later date at Fairview Cemetery, Wahpeton. Linda Lehman was born in Breckenridge, MN, on November 6, 1946, the daughter to Philip John Lehman and Gladys Tina (Fonnest) Lehman. She grew up and attended school in Tintah, MN. After her formal education, she worked as a waitress at various locations. On October 21, 1966, she was united in marriage to Allen Church at St. Gall’s Catholic Church in Tintah, MN. The couple made their home in Fergus Falls, MN, and lived in Germany while Allen was in the United States Army National Guard from 1968-1970. After returning to the United States, they lived in Breckenridge and Linda was employed with the North Dakota State College of Science, Wahpeton, and St. Catherine’s Living Center, Wahpeton, in the housekeeping departments. She also enjoyed waitressing and bar-tending at the Eagles, and VFW in Wahpeton. Linda enjoyed outings with her friends at the casino and playing bingo. Her personality was magnetic; she was a complete joy to be around and was known for her “one-liners.” Crossword puzzles filled the empty slots throughout her day when she wasn’t busy. The love she had for her family was evident in everything she did, and they witnessed her caring nature extend to everyone she encountered. Linda was affectionately known as “grandma” to many in the community. Linda is survived by her children Todd Church of Breckenridge, Teri (special friend, Bob Redzanic) Church of Breckenridge, Wendy Church of Wahpeton; grandchildren, Dillon Church and Heather (Dylan Rosen) Church; sisters, Joann Gronwold of Tintah, Mary Jane Lehman of Minneapolis, MN, and Peggy Erickson of Blaine, MN; many nieces, nephews, great-nieces, and great-nephews; and mother-in-law, Lorraine Church. She was preceded in death by her husband, Allen Church; parents, Philip and Gladys Lehman; and sisters, Anne Aune and Dorothy Bylund. There's still time to send flowers to the Visitation at the Joseph Vertin & Sons Funeral Home from 5:00 PM to 7:00 PM on February 15, 2019.